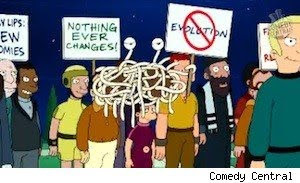 Let us first acknowledge that yes, that is an image of the flying spaghetti monster protesting evolution. Every now and then, a TV show throws some surprises at you, and to my mind, Futurama did that this season with the newest episode, "A Clockwork Origin." Ever since the show's triumphant return to television on Comedy Central, I have watched and loved every episode, even the episode which made wildly offensive (to me, anyway) arguments about things like gay marriage (See the episode "Robosexual Marriage") and Apple (See "Attack of the Killer Apps"). But I'm the kind of guy who likes his opponents if they're clever and have a hilarious way of disagreeing with me. Hence, why I like Christopher Hitchens so much even though he is dead wrong and misrepresents my worldview with every chance that he gets. "A bunch of smiling angry people were handing out these anti-evolution flyers." One protester has a sign that reads, "Nothing Ever Changes!" 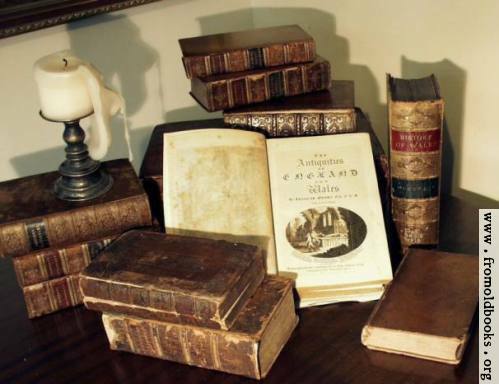 Another reads "Read my lips: No New Taxonomies"
Dr. Banjo: "May I remind you that evolution is merely a theory; like gravity or the shape of the earth." Dr. Banjo: "Things don't exist simply because you believe in them: thus saith the almighty creature in the sky!" Professor: "Your tux doesn't fit because you stole it from a boy!" Bender: "You mean a man; it was his bar mitzvah." By the end of the episode, Dr. Farnsworth's nano-robots have evolved into complex and intelligent creatures. When Dr. Farnsworth tells the robots that he created the nanobots which they evolved from, the robots gasp, "This is creationist talk!" Farnsworth is then arrested for crimes against science. Dr. Banjo calls this "evolution set in motion by an wise and all-knowing creator." While taking exception with the "all-knowing part," Dr. Farnsworth still has a laugh at the idea that he was created by some wise all-knowing bearded man in the sky. This appears to be an intentionally ironic statement. Therefore, in an oddly backhanded way, Futurama appears to be saying at least that theistic evolution is not out of the realm of possibility. But in another backhanded way, the episode also at one point referred to creationism as being unfalsifiable. And therefore, perhaps the conclusion of the episode is simply an outworking of that earlier conviction that if something is unfalsifiable then it shouldn't be discounted. It was interesting to see a TV show that did not take the hard-line naturalist approach to origins, in either case.